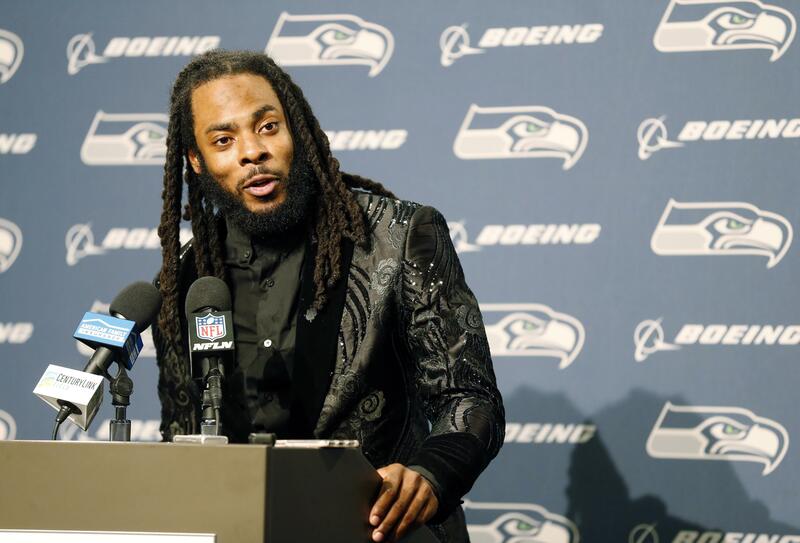 UPDATED: Fri., March 9, 2018, 8:11 p.m.
SEATTLE – Unlike most of you, I wasn’t around during Richard Sherman’s first four years in Seattle. I didn’t get an up-close look at his meteoric rise as he endeared himself to a city. But I can tell you this: When I thought of the Seahawks, I didn’t think of Russell Wilson, Marshawn Lynch or Pete Carroll. I thought of Sherman. He wasn’t just the face of the Legion of Boom in my eyes. He was the face of the team. Nobody embodied the Seahawks’ brand quite like No. 25. Brash? Check. Colorful? Check. An otherworldly defensive talent? That’s a triple check. The end of a Seahawks era wasn’t official until the team released Sherman on Friday. Because frankly, he defined that era. There was what he did on the field, for one. Statistically, Sherman has been the best cornerback in the game over the past seven years. Since 2011, he ranks first in the NFL in interceptions (32), passes defended (99), completion percentage allowed (47.9) and passer rating allowed (50.9). If there is a grand slam for a defensive back, those are the four stats that matter. To be as feared by quarterbacks as Sherman was and still tally that many picks is remarkable. It’s especially remarkable when you consider he ran a 4.56-second 40-yard dash, which is pedestrian (at best) for a corner. Simply put, Sherman has spent the past seven years outsmarting his competition. He has also spent the past seven years outshouting it. You know how I got the aforementioned statistics? Sherman tweeted them Friday. Of course, I had to log out of my original account to see them since he has me blocked, but I think all that gives you a sense of what he’s about. The beefs were everywhere – Skip Bayless, Michael Crabtree, the Seattle media in general. It was often petty and unnecessary, but even if his popularity were at stake, Sherman always stayed true to himself. The thing is, people aren’t a la carte menus. They’re whole. They’re complex. The qualities that made Sherman seem like an egomaniac at times are also what made him a great player. His willingness to speak his mind could aggravate teammates, coaches and media members, but it often entertained them, too. I didn’t always like how Sherman handled himself, but in a time when people are becoming more tight-lipped for fear of making a gaffe, I respected his candor. I think most people in Seattle did, too. Besides, nobody is talking about Sherman’s Twitter wars or intrasquad conflicts right now. In the grand scheme of things, that stuff is inconsequential to the common fan. They’re talking about “the tip” that sent the Seahawks to the Super Bowl. They’re talking about the one-shoed pick six. They’re talking about a sense of confidence that was emblematic of one of the greatest defenses. Sports is entertainment, and Sherman knew how to entertain. Love him or hate him, you can’t dispute that. I have no idea how Sherman will fare going forward. A soon-to-be 30-year-old coming off a torn Achilles tendon is as heads-or-tails as it gets. Obviously, he thinks he’s going to be great, and if he is, I doubt the 12s would mind. Sherman can walk into CenturyLink Field anytime he wants and get a standing ovation. The man abhorred in other parts of the country will always be adored here. The Seahawks of this decade galvanized Seattle in a way the city hadn’t previously experienced. Sherman exemplified their approach to the game. That’s how I thought of him long before I got here. That’s how he’ll be remembered long after he retires. Published: March 9, 2018, 6:57 p.m. Updated: March 9, 2018, 8:11 p.m.